So cute Erin!! Thank you for doing such a great job with my pattern. Coco is irresistible, but then she does remind me a lot of my little Emily! I love how you used a print collar with plain fabric dress. Super sweet. I hope Coco gets lots of wear out of her little Debbie!! Erin!!!! 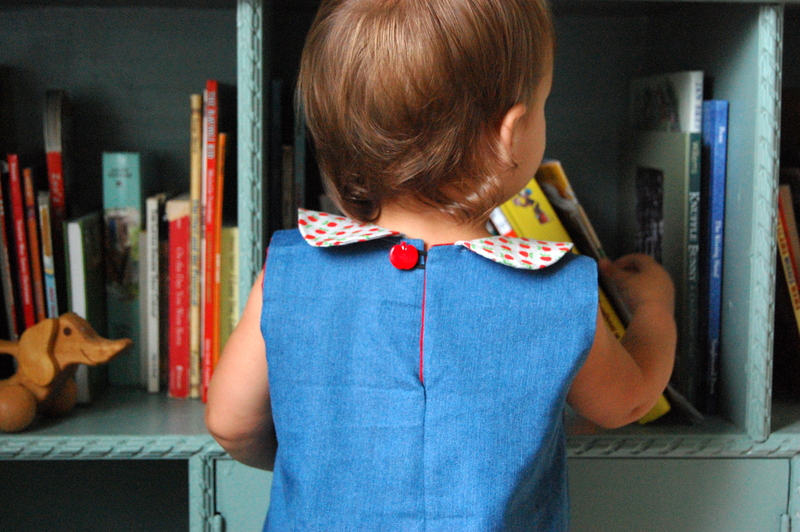 This is so adorable, I LOVE that you did full length trim on the front, what a great idea!! That collar i the. best, and will look great with a cardigan, too. 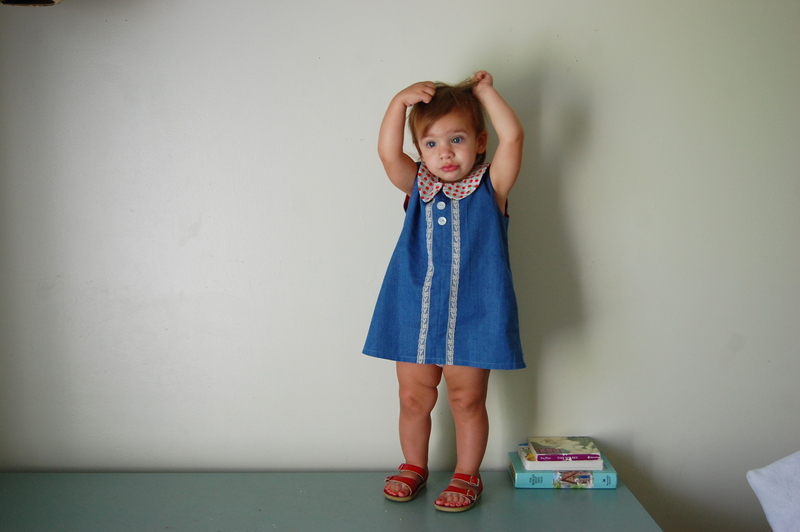 Love your style choices, the red and chambray together, and even her sweet little sandals. Please leave those yummy chunky thighs bare as long as possible, they are the best (!). Can’t wait to see yours on Thursday Monica! Funny- in the first picture of Coco I thought to myself: What yummy little legs she’s got! I don’t blame you one bit for showing them off! Oh, Erin! LOVE this version! Extending the lace trim is brilliant and the apples are so so awesome. And really, CoCo steps everything up a notch, and I can’t get over how adorable it all is! And thank you for the shout out! 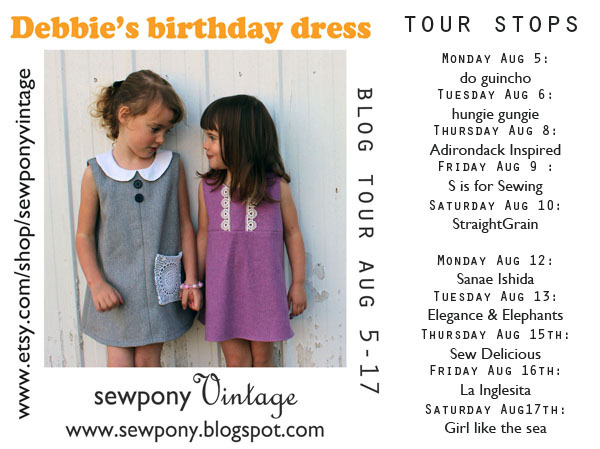 of course- the rainbow dress is a fave! Totally adorable, and I had the same thought about Coco’s thighs! I want to eat them as a snack! NOM. there is enough to go around! your version is so cute! vintage sweetness. My daughter’s nickname is Coco too. hehe. This dress is adorable Erin!! Love the apples and the extended trim. But I must say your little girl and those thighs are the show stopper! Love chunky little toddler legs! thanks Meghan! she’s been blessed with the chunk I guess. oh that smile in the last photo is just too much! the cuteness!!! 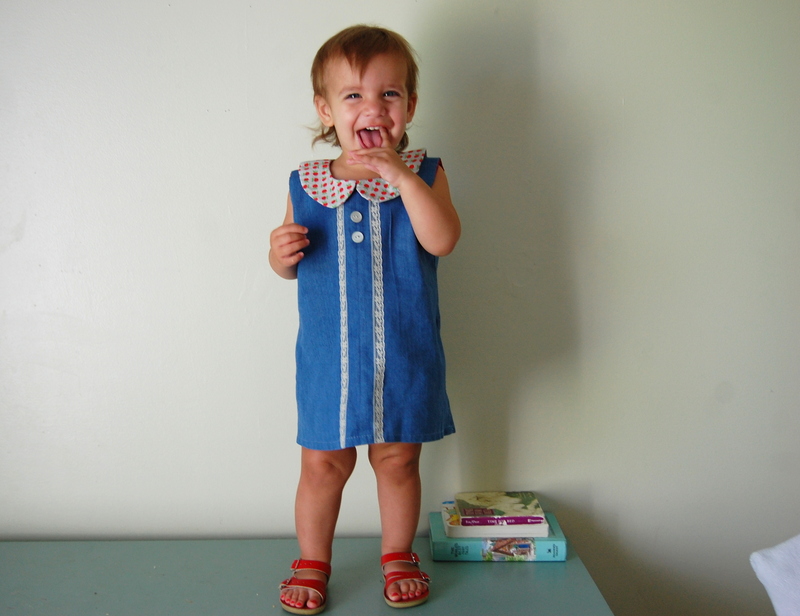 i made a similar dress to this for iris. the pattern was free, but in dutch (i believe). even with google translate, if i had been new to sewing, i wouldn’t have been able to make it work. so i am glad to see this is available in a picture laden, english pattern. 🙂 that big collar is just the best! This is gorgeous! Just got the pattern – all of these versions are irresistible! So beautiful! 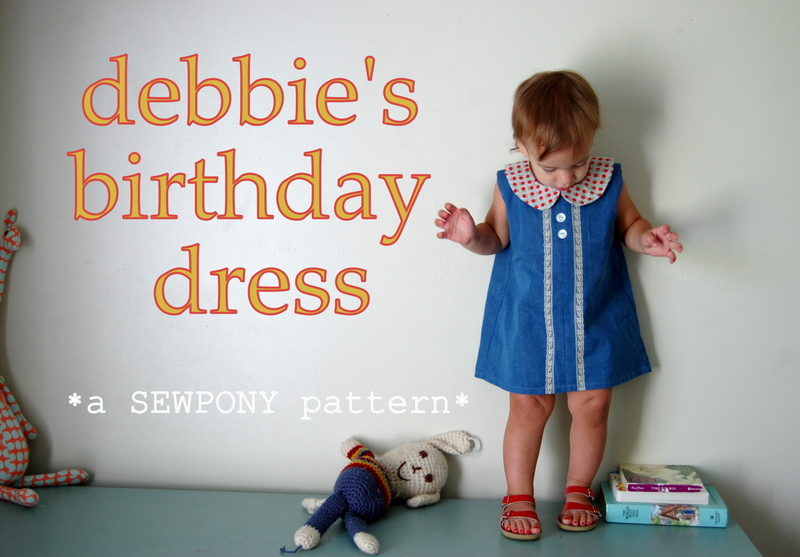 I have a similar pattern, so I’m definitely going to have to go make a little dress no! So cute! You’re a girl after my own heart! Keep the cute clothes coming! 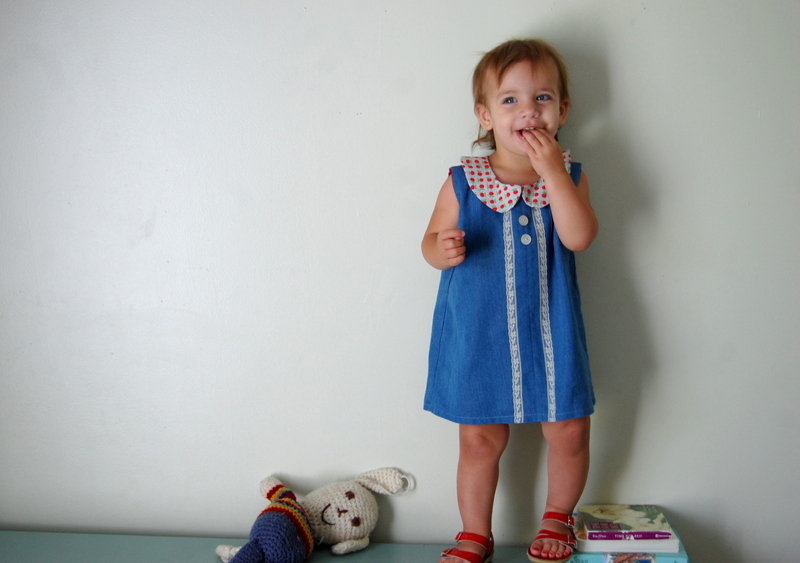 I so need to learn to make a peter pan collar! My girls’ school dress code requires a “collared shirt.” Do you know how hard it is to find cute collared anything? If you promise it to be easy, maybe I could modify pattern to a sleeveless tunic top style for my 6 year old?? over leggings? Hi Grayson… I am about to post tunic length adjustment chart on my blog!! This is adorable and I just love the color and button detail. As always, Amazing! Really gorgeous – the fabric combo works perfectly! Just cleaning out my in-box…and finding all my hungie-gungie-love….makes me want to sew…not logical at 10pm 2 days before leaving town for a week…but all the avery/coco/ellery cuteness is causing so much temptation….I simply must! ARGH…I should be packing! !..darn you ladies!